Ivy Scarborough – lawyer, former adjunct professor of International Studies and Political Science at Union University in Jackson, Tennessee, television, radio and print commentator, radio program host, professional mediator, and author. Teaching, writing and commentary focused on international affairs, terrorism, national defense and religion, reported from and observed in various countries including the states of the former Soviet Union and eight war zones. 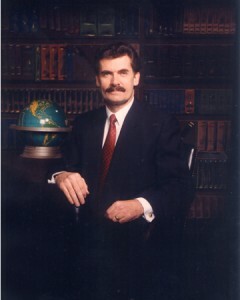 Graduated from Union University, Jackson, Tennessee, with completed majors in History, English and Psychology; received Doctor of Jurisprudence degree with an emphasis in international law from University of Memphis Law School. Family: Lives near Jackson, Tennessee with his wife Mona; father of two adult daughters. Click here for information on Mr. Scarborough’s writing, lecturing, and commentary. Click here for more information on the eight war zones Mr. Scarborough has entered.